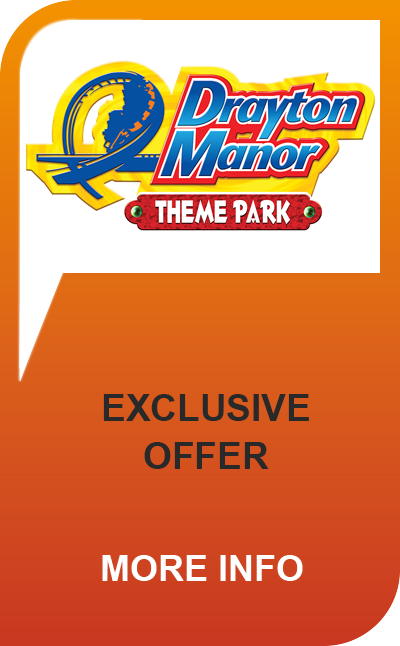 Located in the West Midlands Drayton, is home to everyone’s favourite theme park Drayton Manor. Packed with a huge selection of great rides and attractions Drayton Manor features some of the wildest and wettest rides around! You can make it a mini-break to remember and stay at the Drayton Manor Hotel set in 230 acres of beautiful grounds it was once the home of Sir Robert Peel - father of the modern police force. With Birmingham just a short train journey away why not visit the Birmingham SEA LIFE Centre, or for the theme park addicts Alton Towers lies just 27 miles and a click away with a ticket from 365 Tickets.